This is the most famous and most visited of the Wildlife Parks in Kenya; 270 kms from Nairobi (4-5 hours by road). Here in Maasai Mara one can find large numbers of Maasai Lions, African Leopards and Tanzanian Cheetahs; the biggest spectacle in East Africa also takes place here….the Wildebeest Migration to and from the Serengeti (Tanzania) from July to October. Maasai Mara is located in the Southwest of Kenya, combined with the Serengeti is the most spectacular game-viewing eco-systems in the world. The Reserve stretches 1,510 square kilometers. Here there are over 95 species of mammals and almost 600 species of birds. Lake Nakuru is a soda lake, just south of the town of Nakuru, protected by the Lake Nakuru National Park. The abundance of algae, created by the flamingo droppings, in turn, attracts the literally millions of flamingos that line the shore. In addition, other attracted species are exotic mammals such as the 30 Eastern Black Rhinos, 70 White Rhinos, giraffe and baboons. The Park also has many Maasai Lions, African Cheetahs and Tanzanian Leopards. Photographs of the flamingos on Lake Nakuru are world famous. It is truly an amazing site, overwhelming the first time. Amboseli National Park is 392 square meters in size; the core of the 8,000 square kilometer ecosystem that spreads across the Kenya-Tanzania border. The park is famous for its Elephants; some 2,000 live there in harmony with the Maasai people. The park is located 240 kilometers southeast of Nairobi; it is the second most popular National Park in Kenya, after Maasai Mara. 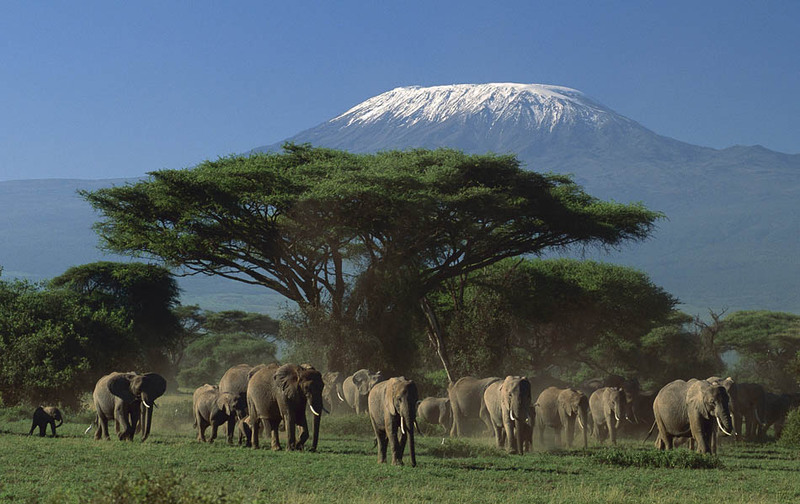 Amboseli has the largest population of free-ranging elephants; but it is also famous for its spectacular views of Mount Kilimanjaro, the highest free-standing mountain in the world. 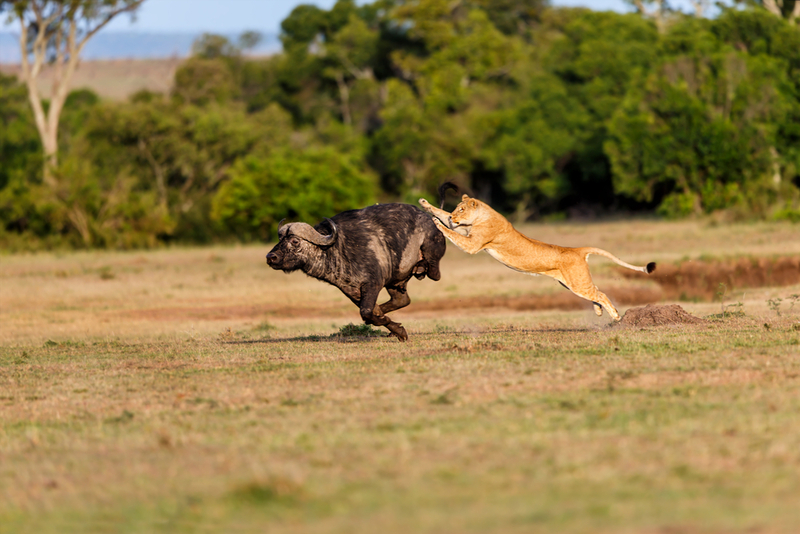 It offers some of the best opportunities to see African wildlife, including cape buffalo, impala, Maasai Lion, Tanzanian Cheetah, spotted hyena, Maasai giraffe, plains zebra and the blue wildebeest. There are very strict rules in Amboseli for visitors; never to get out of the vehicle, except in designated spots, no harassing the animals, no off road driving – basically the animals have the right of way always. Lake Manyara National Park is located 126 kilometers southwest of Arusha. The park is 330 square kilometers in size; 200 square kilometers is occupied by the Lake itself. 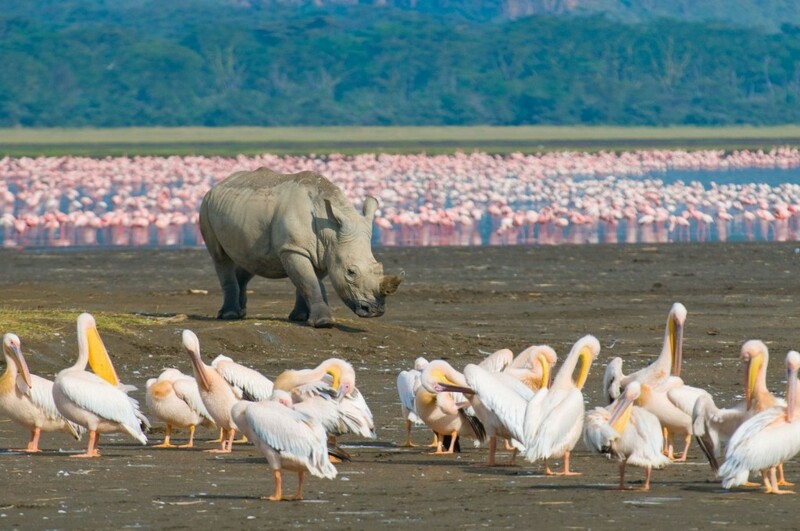 Lake Manyara is a soda lake, home to over 400 species of birds, the most obvious being the Flamingo. In addition, the park is well endowed with game animals; African leopards, Maasai Lions, Tanzanian Cheetahs, African Bush Elephants, Blue Monkeys, Dik-Dik, Thomson’s gazelle, Hippo, Maasai Giraffe, Impala, Grant’s zebra to mention just a few. At one end of the Park, there is a Hippo Pond, where visitors can get out of their cars and, from a safe distance, can observe the Hippos. When you arrive in Nairobi at Jomo Kenyata International Airport; you will be met by your Jewel Safaris guide, given a short briefing on the itinerary and taken to your hotel to check in. After check in at your hotel, you will be given a city tour of Nairobi; depending on the time of day; your guide will take you to a local Kenyan restarurant for lunch so that you can experience some of the traditional foods offered. The city tour will include cultural and historical sites in the greater Nairobi area, as well as a visit to the Maasai Market to explore the great variety of handicrafts produced in Kenya. Before night fall, you will return to your hotel for dinner and prepare for an early morning drive to the Game park..If you choose to go out on the town, consult with the Jewel Safari guide, who will be a wealth of information on what is available; Nairobi is a very vibrant city with many clubs, bars, restaurants and music venues. The Jewel Safari guide will meet you in your hotel in Nairobi, you will depart in our Safari vehicle for Masai Mara National Reserve. Arrival time will be around lunch time and after checking into your hotel, you will be served lunch. After lunch, your guide will take you on an Afternoon Game Drive, which lasts 3 or 4 hours. Maasai Mara is famous for its cats; lions, cheetahs, leopards are all present in the Park and there are many of them to see. In addition, Maasai Mara does have dozens of mammals to view, such as the zebra, elephant, buffalo, various antelopes as well as warthogs, wildebeests, eland and hundreds of bird species. After the game drive, before night fall, you will be driven to your hotel for dinner and a good night’s rest. After breakfast in your hotel, you will either go for a morning Game Drive or a Balloon Ride. The Balloon Ride is a totally different perspective; seeing the wildlife roaming the plains of Maasai Mara, with a bird’s eye view can be quite extraordinary. Silently floating above the herds of animals gives you a unique photographic opportunity. You will return to the hotel for lunch and a little relaxation before going out again to search for more wildlife. After lunch, you will go out either on a Game Drive or a Balloon Ride, depending on which you chose to do in the morning; the magnitude of wildlife in the park will enable you to certainly experience a “kill”, the ultimate viewing and photographic experience. Before night fall, you will return to your hotel for dinner. After breakfast, you will pack up and leave Maasai Mara and drive East through the Rift Valley region of Central Kenya to Lake Nakuru. En route, you will have opportunities to stop and shop at the Maasai handicraft stores and street vendors that offer locally made crafts. .
You will be taken for lunch to a local Kenyan restaurant to experience traditional food; this will be either in Narok or in one of the other towns along the way. You will also see many vendors selling locally grown vegetables and fruits on the side of the road; the Rift Valley is the fruit and vegetable garden for this sector of East Africa..
After lunch, proceed to Lake Nakuru National Park to view the millions of Flamingos as they gather at the shores of Lake Nakuru to feed. This will be followed by a Game Drive within the Lake Nakuru National Park to seek out and view the largest concentration of Rhino in East Africa. Before it is night fall, you will be taken to your accommodation for Checking in and Dinner. After Breakfast, you will begin your drive to Amboseli National Park, via Nairobi. The 2 to 3 hour drive is very scenic, especially along the rim of the Rift Valley wall. Spectacular vistas of the Rift Valley can be enjoyed as you move in an easterly direction through the lush green agricultural lands. At arrival in Nairobi, you will have lunch at Carnivore Restaurant; famous for their barbequed game meats. As you enter the restaurant, you will find a large chalk board displaying the daily catch – dozens of game animals, everything from warthog to crocodile, as well as domesticated animals, are prepared for your tasting. After Lunch, you will drive onward to Amboseli National Park, home of the proud Maasai Tribe and almost 2,000 elephants. After checking in to your hotel and a short rest, you will go on an afternoon Game Drive. Crossing over the dry lake bed of Lake Amboseli is most interesting as you follow along with large groups of Ostrich, crossing from one side to the other. Before night fall, you will return to your accommodation for dinner and an early night. After breakfast, you will be taken by your Jewel Safaris guide on an all-day Game Drive within the park. Lunch will be a picnic served on a site facing Mount Kilimanjaro, which is just south of the park on the Tanzanian side of the border. The snow-capped mountain sits in contrast to the overwhelming heat of the sun on the park’s plains area. You will encounter many Hippo and Buffalo in and around the swampy areas of the park; here you will also see many waterbirds that co-exist with the large mammals that enjoy the cool watery wetlands. . In the late afternoon, before night fall, you will return to your lodgings for dinner. After breakfast you will pack up and drive to the Tanzanian border crossing of Namanga; after clearing both Kenyan and Tanzania immigration and customs, you will proceed to Lake Manyara National Park. The scenery changes radically as you leave the lush oasis of Amboseli National park, and so does the wildlife. Along the road you will have an opportunity to stop and purchase locally made crafts; many Maasai craftsmen and women sell their products in small shops and on the roadside. You will be served lunch at your lodgings after you check in. There will be some time for a rest before continuing your day’s activities. After lunch, you will be taken on an afternoon Game Drive in the Lake Manyara National Park to seek out some of the wildlife that is roaming for food and water. 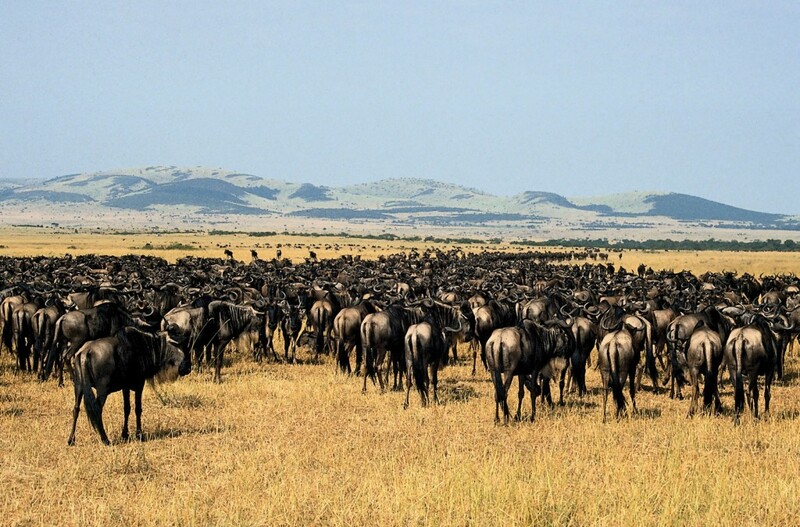 Large herds of animals can be seen, especially later in the afternoon as they seek a safe place to spend the night. Before night fall, you will return to your lodgings for a rest and dinner..
DAY 8: SERENGETI NATIONAL PARK AND OLDUVAI GORGE. After breakfast, you will depart Lake Manyara for the Serengeti National Park. En route you will pass via Olduvai Gorge, where you will enjoy both the unusual topography and the wildlife that exists within the gorge. You will take lunch at your lodgings in the Serengeti, after checking in. After lunch you will go on an afternoon Game Drive in the Serengeti. 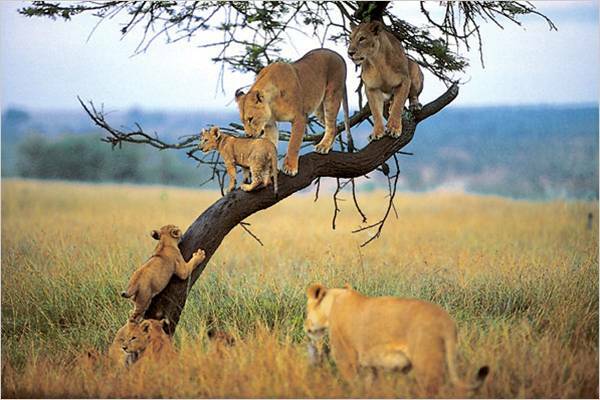 The Serengeti is Africa’s most diverse ecosystem with an unbelievable number of animals, birds, reptiles and insects. The vastness of the Serengeti makes Game Drives unusually quiet; even though it is the most visited National Park in East Africa, one can go for hours without encountering other visitors; photographers enjoy this aspect, as in other venues there can be vehicles full of tourists in the background of so many wildlife pictures. Before night fall, you will return to your lodgings in the late afternoon for dinner. After breakfast you will be taken on a morning Game Drive. There are many animals that can only be viewed at this time of the day, as after the sun comes up, it gets extremely hot in the open plains and many species seek shelter under trees and in bushy areas. It is also a good time to see a “kill”, as the predators are out and about hunting for food. After a few hours, you will return for lunch at your lodgings. There will be some time to rest up a bit as well, after the long game drive and early morning start. After lunch you will be taken on an afternoon Game Drive to continue your search for different game. The swampy wetlands and river banks are excellent places for the afternoon, as many animals seek the water to cool themselves off from the burning sun. Crocodiles sit waiting for their next meal by the river banks and it can get exciting watching them feed. After breakfast, you will drive to the fabled Ngorongoro Crater. You will be guided around the rim of the Crater with the help of a Park Ranger, as well as a Maasai guide; this will be done on donkeys, both because the roads do not the viewing opportunities that the small trails do and secondly, because it is a unique way to grasp the beauty of the surrounding. .
You will follow the track around the rim through open woodland and acacia forests. To the right you will stop at a simple camp set up in a remote location where one of the significant rivers flows off the highlands, entering the crater below. Here you will be served lunch; enjoying your food with the spectacular vistas that one finds overlooking the Crater below. Later in the afternoon, you will be taken to your lodgings for a rest and dinner. DAY 11: NGORONGORO CRATER GAME DRIVE. After an early morning breakfast, you will go on a Game Drive inside the Ngorongoro Crater itself. As in the Serengeti, the Crater animals are all out and about early in the morning, when the temperatures are cooler. There are many predators in this sector, and seeing them feed is one of the spectacles of an African Safari. Together with the Maasai that live in the Crater, this part of Tanzania, is most unique. Lunch will be a picnic on the Crater Floor; a shady spot overlooking the game on the plains in the distance, is a most pleasant and somewhat unique experience. After the lunch break, you will continue on the Game Drive for the afternoon; a visit to a Maasai Boma (homestead) will give you lots to think about in terms of the co-existence between the different habitants of the Crater area. This is the only National Park in Tanzania that allows the Maasai, or any other humans to live with its borders. Before night fall, you will return to your lodgings for dinner in the late afternoon. DAY 12: RETURN TO NAIROBI, VIA ARUSHA. After breakfast, you will pack up and begin your return to Nairobi. En route, you will stop in the town of Arusha; a busting urban area and huge trading center for the area. Here in Arusha there are many local markets with both local produce and crafts for sale. Arusha is also a stopping off point for people traveling on the Nairobi/Dar es Salam road and serves as a north/south hub where most travelers stop on their way to Nairobi, Dar es Salam, the Serengeti, Ngoronogor Crater and Mount Kilimanjaro. Lunch in Arusha and some handicraft shopping at the Maasai market. After lunch, you will continue with your journey to Nairobi, arriving in the afternoon. The Oakwood Hotel is centrally located in the heart of Nairobi, across from the historic Stanley Hotel on Kimathi Street. There are 20 self contained rooms at the Oakwood. The restaurant and bar is popular with locals as well as tourists. The Fairview is a mid-range hotel, approximately 1 kilometer from the Central Business District of Nairobi. The hotel has lush gardens on its property with bars and restaurants overlooking them. This is a full service hotel, providing convenient and semi-luxurious accommodation. Apartments available for long stays. Luxury all-suite hotel in the center core of Nairobi. Excellent buffet lunches in their main dining room. Full service hotel; rooms have all the modern conveniences and nicely furnished. The Governor’s Camp has provided overnight accommodation for over a century. It is nestled in the forest along the winding banks of the Mara River. The River itself is alive with hippos, crocodiles and many bird species. The accommodation is in well appointed luxury tents, all viewing either the Masa River or the plains of Masa Mara; animals are in plenty day and night in this area of Masa Mara National Park. Dinning Tent overlooking the Plains of Masa Mara. This popular Safari Lodge is situated on the Oloololo escarpment of the Great Rift Valley, with spectacular views of the open plains of the Masa Mara. The accommodation is in Safari Tents, each with a private bathroom, shower and terrace. The food is Pan-African cuisine. Kichwa Tembo Tented Camp is a popular safari lodge, situated on the spur of the Oloololo escarpment of the Great Rift Valley, with spectacular views across the open plains of the Maasai Mara national Reserve with its many wild animals. All rooms are self-contained upscale Safari Tents with terraces. The Mara Safari Club in considered the finest accommodation in the Masa Mara National Park. The property is surrounded on 3 sides by the Mara River, the main Lodge is in the center of the camp, with an indoor restaurant, bar, library. Off the dek, is a swimming pool with another bar and private massage tents. The accommodation is in luxury tents, each with 4 poster beds, private bathrooms, as well as outdoor showers. Each tent is equipped with a veranda for wildlife viewing. This accommodation is a budget alternative for adventure travelers; offering basic camping to cottages. There are hot showers offered, a bar and restaurant. The power is Solar and is an option for those travelling with pets. The Camp is 3 kilometers outside the Sekenani Gate of Masa Mara National Reserve, 300 meters from the main road. The Lodge offers a choice of accommodation; family rooms, cottages and suites are available. In addition to the restaurant fare, there are Bush barbecues to give the guests an opportunity to feed on unusual meats. The lodge offers views of Lake Nakuru and the flamingo population. The hotel was established some 100 years ago and has traditionally been considered the best accommodation in the area. There are 30 luxury tents at the camp, all with modern conveniences. They have a bar and restaurant; both highly recommended by tourists and locals. The camp is very close to the main gate of Lake Nakuru National Park. The Amboseli Serena Lodge is secluded within a grove of Acacia trees, overlooking Mount Kilimanjaro; with views of the golden savannah plains as well. The property is landscaped with trees and vegetation to create an oasis effect. The central dining area is reached by a timbered bridge over a melt-water stream. The lounge and bar feature a wide terrace with a fire pit. The Amboseli Sopa Lodge is nestled in the foothills of Mount Kilimanjaro on a 200 acre property of lush gardens and a spectacular view of Mount Kilimanjaro. The landcaping is enjoyed by many monkeys, birds and butterflies; creating a mini-safari walk within its boundaries. Lake Manyara Serena Lodge stands on the edge of a towering terracotta escarpment with panoramic views of Lake Manyara. The vanishing horizon swimming pool with its restaurant and bar terrace overlooking it, is most unusual. The landscaped compound welcomes the indigenous birdlife to share the environment with the guests. Lake Manyara Hotel is located such that all the 100 guestrooms have excellent views of Lake Manyara. This is a full service hotel, with all the modern conveniences available for their guests. Spectacular views of Lake Manyara.